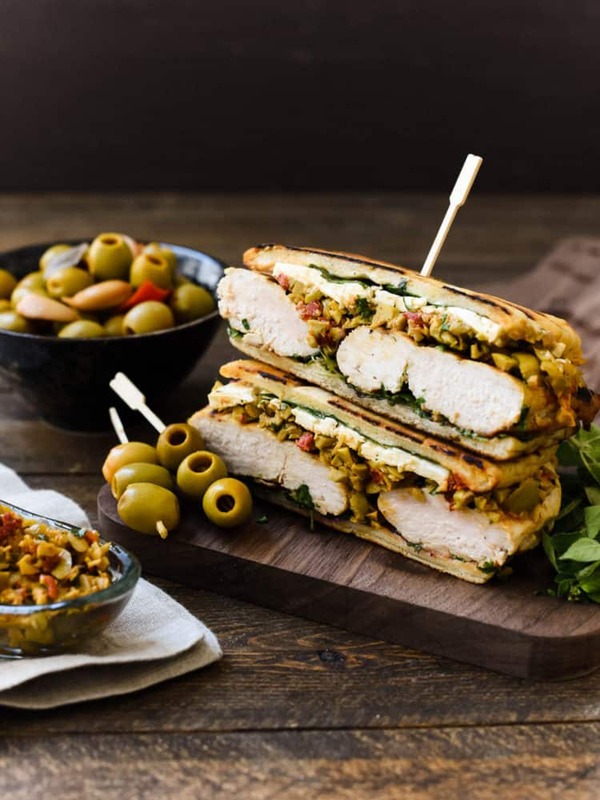 The ultimate sandwich for olive lovers: Olive-brined Chicken Sandwich with Olive Tapenade gets its incredible flavor from chicken brined in a Spanish blend olive brine, savory feta cheese, and a hearty spread of olive tapenade. 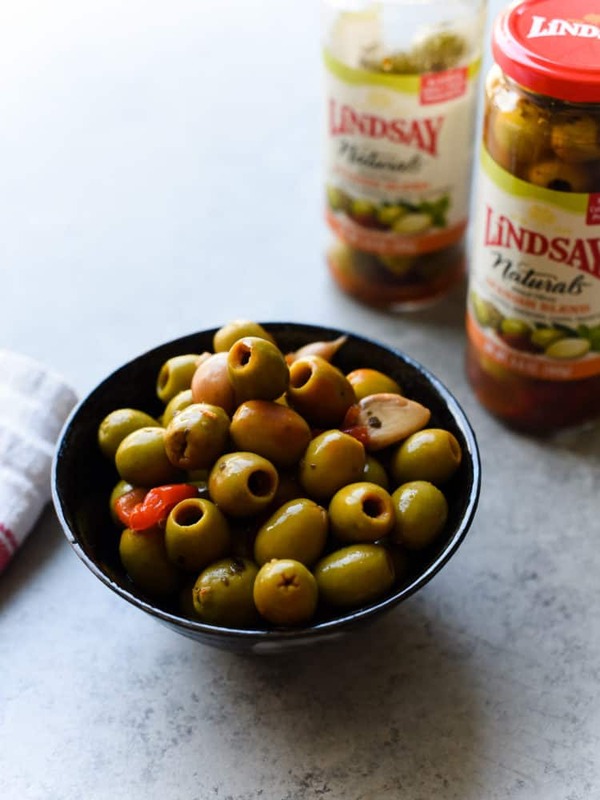 This post is sponsored by Lindsay olives. Even before picnic weather coaxed me to consider eating outdoors again, dreaming up all kinds of portable deliciousness, we’ve had a head start in the al fresco dining department. Not because of beautiful sunshiny days — although we’ve definitely had some beautiful ones — but because our little guy has been busy with a little something called baseball. His games this spring had the uncanny timing of coinciding often with lunch and dinner, which meant lots of picnics — in the rain and otherwise. So I’ve been packing all kinds of meals, from take-out sushi to salads and sandwiches. And while sandwiches may sound rather drab, I have something that I know will convince you otherwise. 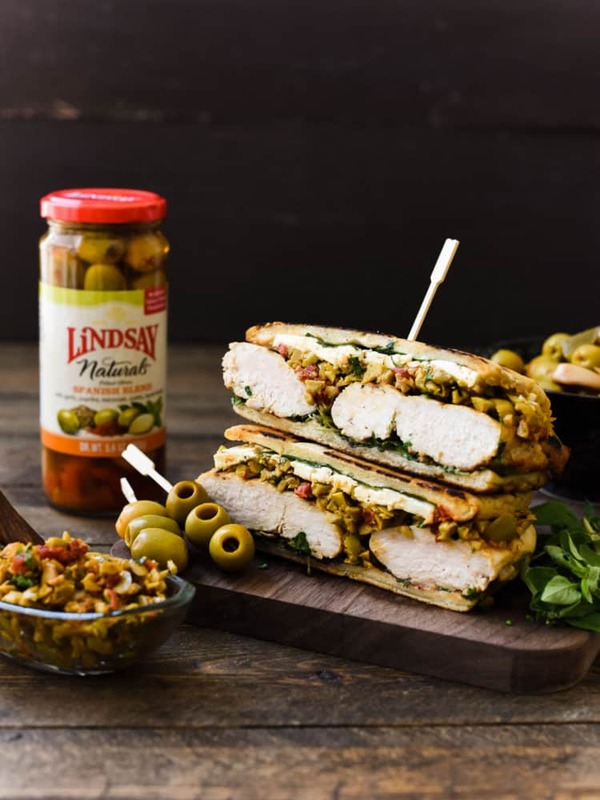 Olives are my family’s absolute favorite sandwich topping — one of the few we ALL agree on; you can bet that even when we’re out and about and grabbing a sandwich from our favorite deli, they’ll always make sure, “Did you ask for extra olives?” as they peek under the bread to make certain. Well, I’ve created a sandwich for all my fellow olive lovers, and you don’t even need a picnic as an excuse. 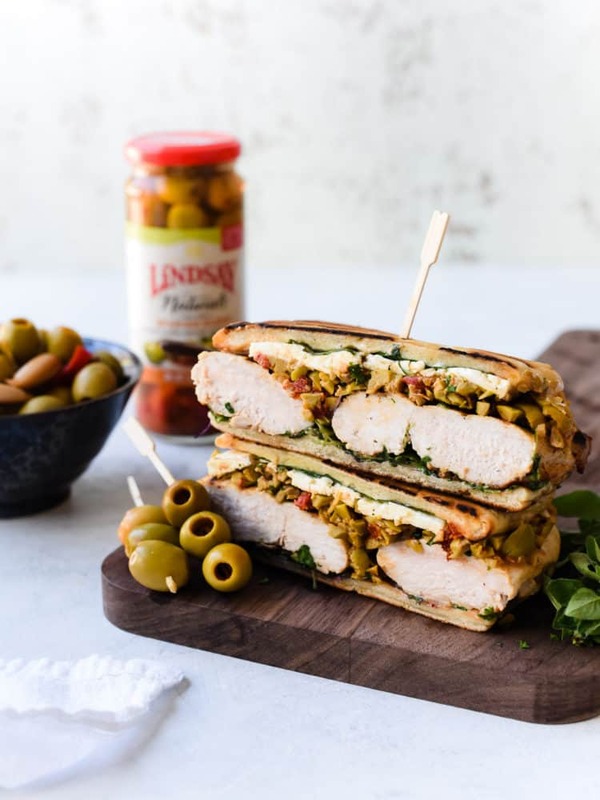 This Olive-brined Chicken Sandwich with Olive Tapenade makes use of that incredible brine that is wont to be thrown out. And what a shame, because it can be used for so much more than a dirty martini! 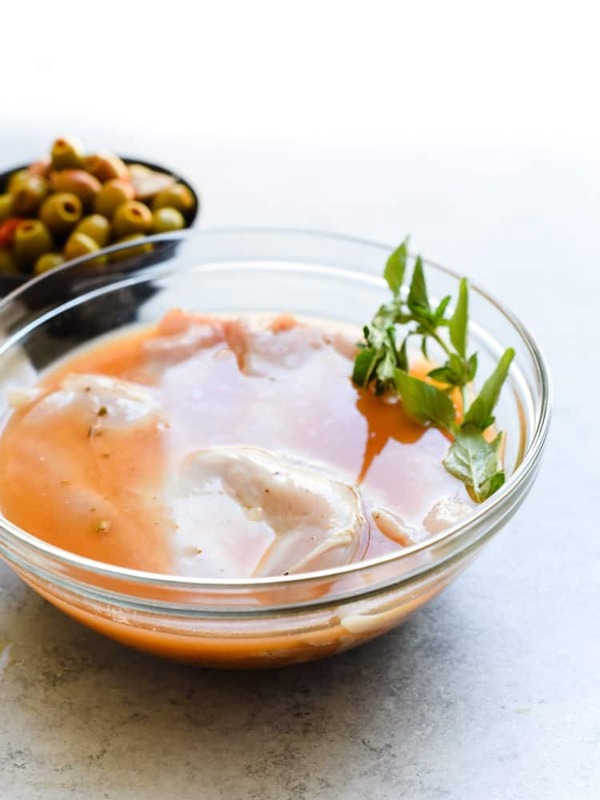 When I was cooking with one of my favorite olive blends, I realized that the brine would be perfect for coaxing some chicken into tender, flavorful submission. The Naturals Spanish Blend, which is spiced with garlic, paprika, marjoram, cumin and laurel leaves, has so much flavor in its olive juice, that it works as a marinade and brine at once, and it doesn’t take too long for it to work its magic, transforming chicken from plain to perfectly seasoned. 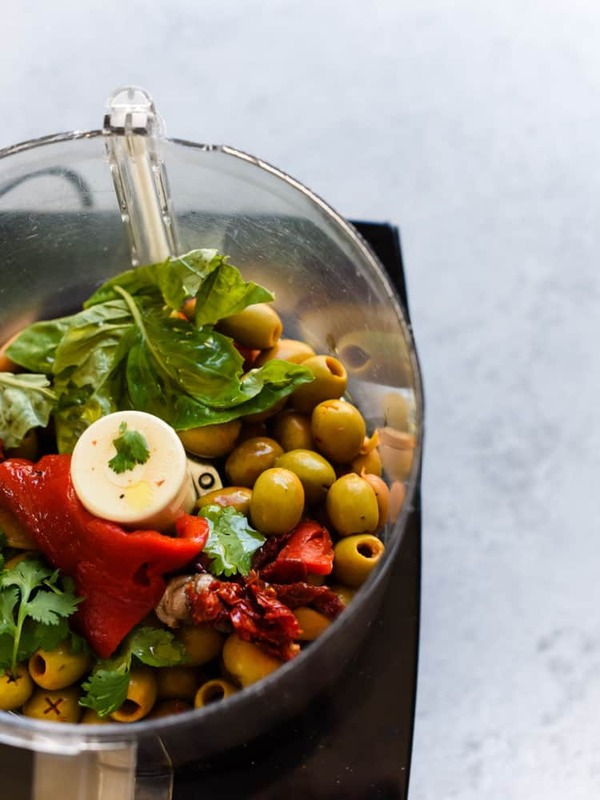 But because we are such olive lovers, I gave the olives a whirl in the food processor with some fresh herbs, sundried tomatoes, roasted red peppers, a touch of anchovy paste and olive oil to make the most delicious olive tapenade. The tapenade, when slathered on some tender bread, with slices of feta and the grilled chicken is so ridiculously good — even a picnic in the rain is worth it. Baseball season is coming to an end, but this olive brined sandwich will continue in rotation for us — whether as a lunch to pack for work, a quick bite on weekends, or a satisfying dinner. Disclosure: This post is brought to you in partnership with Lindsay olives. Thank you for supporting brands that matter to me; sponsored posts such as this help behind the scenes at Kitchen Confidante. All opinions in this post are, as always, my own. 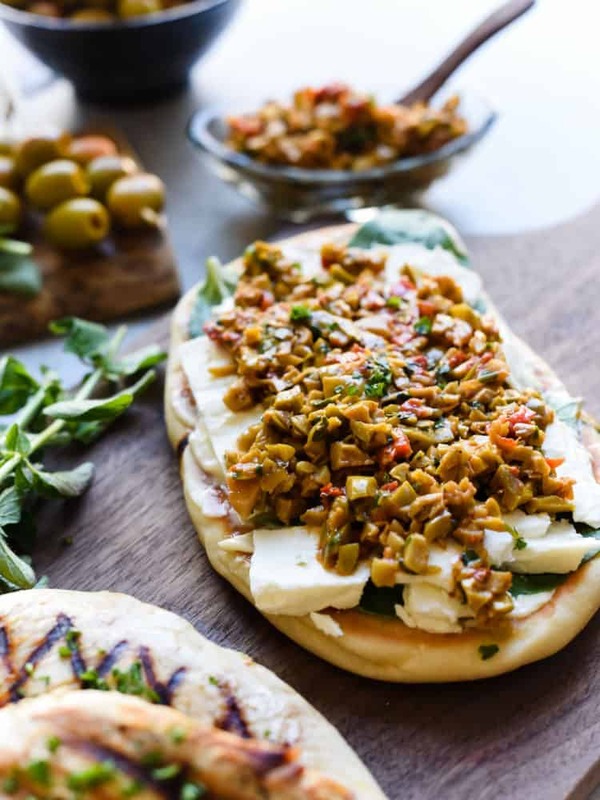 If you love olives, this sandwich is for you! 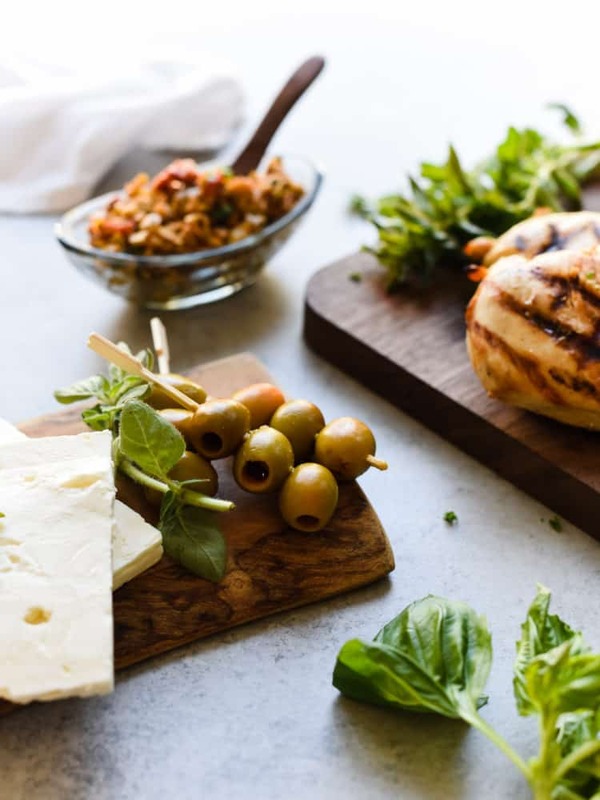 Olive-brined Chicken Sandwich with Olive Tapenade gets its incredible flavor from chicken brined in a Spanish blend olive brine, savory feta cheese, and a hearty spread of olive tapenade. 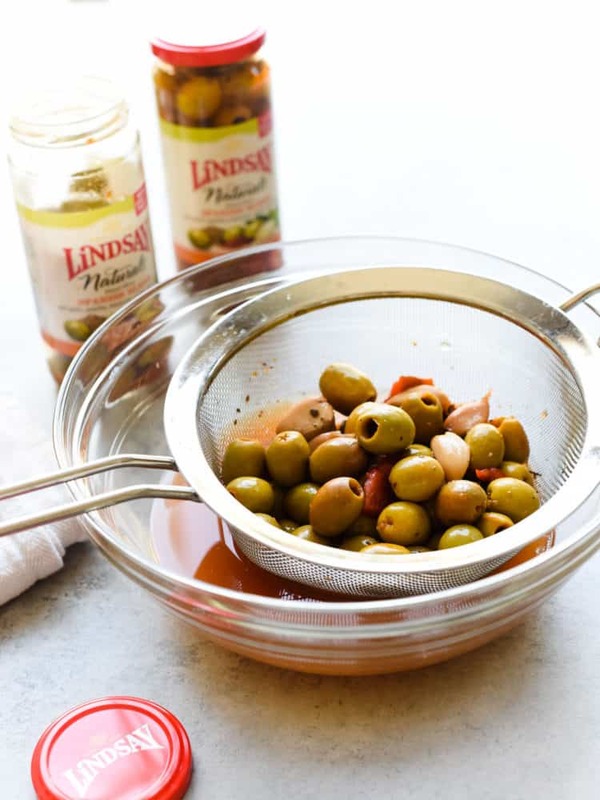 Drain the olives, reserving the olives for the tapenade, and placing the olive brine in a shallow glass bowl or resealable bag. Add the chicken to the olive brine along with a sprig of oregano and let it sit in the refrigerator for about 30 minutes to 1 hour. While the chicken brines, make the olive tapenade. 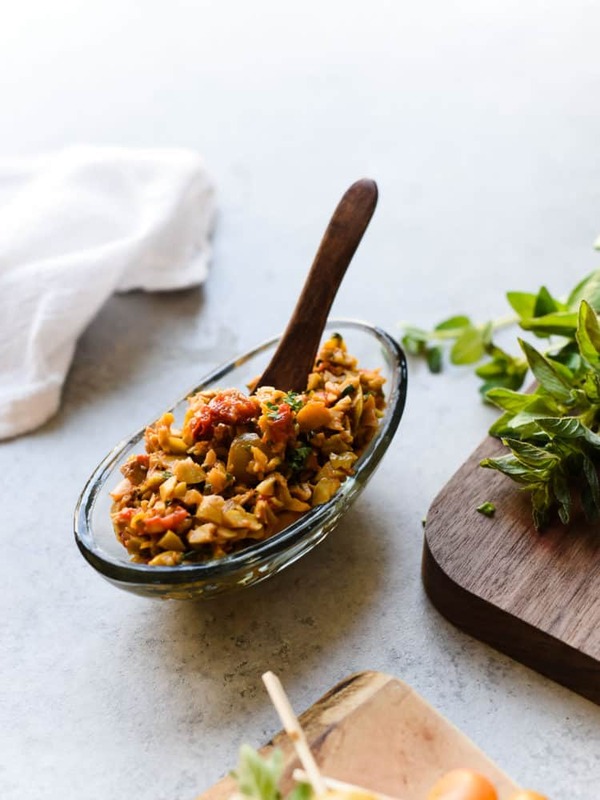 In the bowl of a food processor, add the olives, basil, cilantro, parsley, sun-dried tomatoes, roasted red pepper, anchovy paste and olive oil. Give it a few pulses until the olives are still chunky, or your desired consistency. Preheat a grill or grill pan to medium-high heat. Drain the chicken and pat dry with paper towels. Lightly brush the chicken on both sides with olive oil, then lightly season with salt and pepper. Grill the chicken, rotating periodically, for about 10-12 minutes or until the internal temperature of the chicken is about 165°F. Remove from the grill and let it rest. Prepare the bread: if you are using naan as I have, or a sliced bread, you are all set, but if you are using a bread like focaccia, slice it in half. Slather two halves with a touch of mayonnaise. Top with greens, slices of feta spread a generous amount of tapenade. 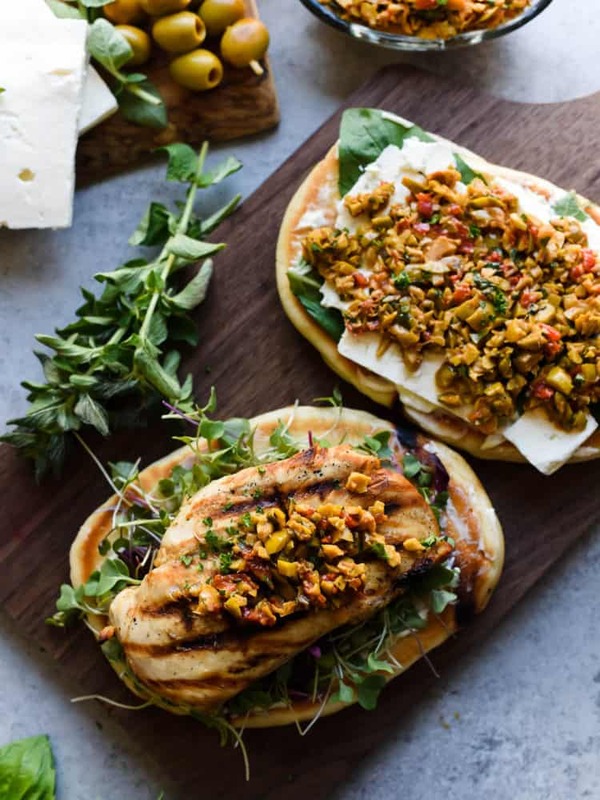 Arrange the grilled chicken and top with a little more tapenade, followed by the bread. If you wish, you can toast the sandwich in a panini press, but it is not necessary. MMMMMMM…. i see this happening VERY soon!!! and again & again & again! thanks for bringing this olive laden fabulousness to light!!! Hurray! I’m so glad and I hope you enjoy it , Lisa! Olives are indeed a favorite of mine. I’ll make this sandwich for my lunch next week and we’ll see how it goes, but I just know it is going to be a hit! Definitely let me know how it goes, Dan. Enjoy! Ooh, caper juice would make a delicious brine, Kankana! Love it! There’s nothing better than summery picnics and this sandwich is the perfect lunch idea! And summer is here, at least for you and I (yippee)! I love that this sandwich is so portable and that the flavors even meld more together over time!